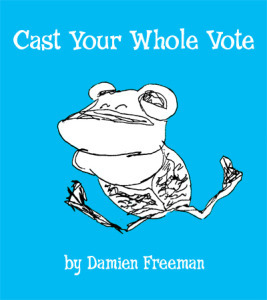 Cast Your Whole Vote is a story that Freeman wrote to explain the Australian Constitution and system of government to school students. In nine short chapters, the story provides a novel introduction to the electoral system, the Australian Parliament, Government, Governor-General, and the High Court, as well as the importance of checks and balances on abuse of public power, and the importance of public participation in democracy. The narrative places the discussion of the machinery of Australian government in the context of contemporary citizenship issues including gender and ethnic identity, traditional and contemporary indigenous culture, historical themes including the Gold Rush, the Anzac legacy, regional Australia, and the environment.